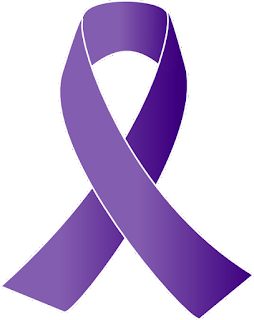 November is Alzheimer’s Awareness Month, which is particularly meaningful to me this year. Alzheimer’s is a difficult thing. But I never knew just how difficult until I began researching for my next Heartwarming release, A Song for Rory. In this second novel of my Findlay Roads series, Sawyer Landry is just reaching the peak of his country music career as winner of a prestigious award. The only thing missing from his life is Rory Callahan, the girl he left behind when fame came calling. But when he returns to his hometown to win Rory back, he learns that his father has been diagnosed with early onset Alzheimer’s – a much rarer (and genetic) form of the disease. Early onset Alzheimer’s affects only about 5% of the population but can begin as early as one’s thirties. Because it is hereditary, patients likely inherited it from a parent or grandparent. Like the more common form of Alzheimer’s, the disease steals gradually and with devastating effect. Victims lose track of time – not only hours but years. It might be July, and an Alzheimer’s patient will be convinced it is Christmas…ten years earlier. As the disease progresses, it is common to forget things that you once took for granted – how to tie a shoelace, turn on the television, make a phone call, or follow a recipe. A victim of Alzheimer’s might lose their place in conversation, forget where they are or how they got there, or be unable to recall someone’s name, even if they’ve known them for years. And to me, the worst part is that eventually, Alzheimer’s steals memories of loved ones and eventually, the ability to recognize them. It eats away at a person’s identity until they no longer know themselves or the people they love. While this disease is devastating at any age, it is particularly challenging for those who develop the symptoms before the age of 65, which is when early onset begins. Fathers face the possibility of never walking their daughters down the aisle. Wives realize they may only have a handful of anniversaries left with their spouse. Children face the stark reality of losing their parents before they’ve even reached their teenage years. Alzheimer’s steals in immeasurable ways. So Sawyer faces a tough decision in A Song for Rory. Knowing he might inherit early onset Alzheimer’s from his father, he and Rory reach a crossroads where they have to determine whether their love can withstand the possibility of this life-shattering disease. You can pre-order A Song for Rory on Amazon in paperback or for Kindle, Barnes & Noble in paperback or for Nook, or at Harlequin.com in paperback or eBook. If you have a personal story to share about Alzheimer's, leave a comment below. I'd love to hear from you! Be sure to check in next month, on December 9 when my blog partner, Loree, is back, and we share another edition of We Talk to Ourselves…A Lot! Hi Cerella, Be so thankful you haven't had to deal with this disease personally. My mother-in-law and all her sisters developed Alzheimer's (Not the early onset) It is devastating and so difficult for the families. You are brave to tackle it in a romance. In my latest work that I just finished, my heroine is taking care of her mother-in-law who has Alzheimers. There are humorous moments that the Lord gives you. I cherish those and wrote them in the story. Thank you so much for sharing these challenges you've witnessed, Sandra. It was such a heartrending experience to read people's encounters with this disease - there are light moments, but so many dark ones. I wish your family strength and comfort as it struggles with Alzheimer's. I've been sitting here, thinking about your poignant post and not knowing what to write. I have seen friends experience a parent's Alzheimer's and it is devastating. I expect it wasn't easy to tackle such a weighty subject in your March release, but how wonderful of you to donate a portion of your proceeds to Alzheimer's charities. The snippet you shared is very impactful. 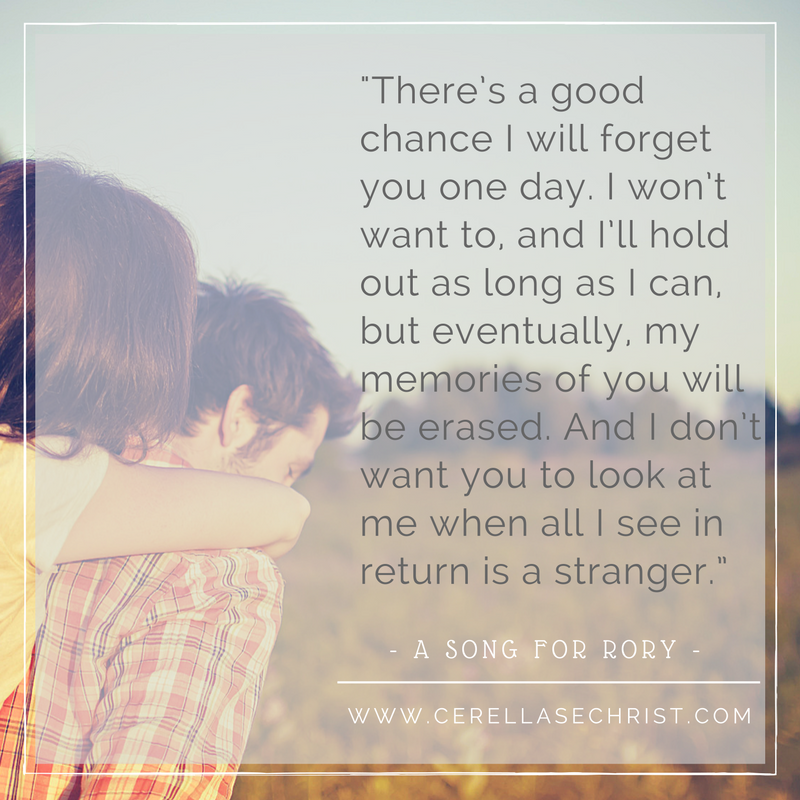 I look forward to sharing a release date with you, and to reading A SONG FOR RORY. Thank you, Kate. It was definitely a tough subject, especially because I haven't had much firsthand experience with it, and yet, I really wanted to honor the struggles families go through. I hope I succeeded, and I want to pay it forward to them in any way that I can. Cerella, I'm not sure there's a more cruel disease out there than Alzheimer's. My friend's mom was just diagnosed and it's heartbreaking. I'm so touched by your commitment to donate to this cause. A Song for Rory sounds like a wonderful story. Well said, Carol. It is so devastating, and that's what made A SONG FOR RORY both an honor and a challenge to write. It's difficult to express how much Alzheimer's takes away. My thoughts go out to your friend and her mom. I wish for them as many good days as tough ones in the times ahead. 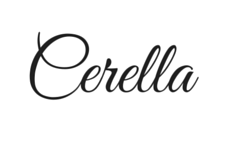 Cerella, good for you---taking on this insidious disease in a story where it will educate your readers. Our love stories do more than entertain sometimes. This is so true, Roz! That's part of what I love about writing for Heartwarming - it gives us the chance to tell stories that are very real because they're inspired by the day-to-day love and miracles we encounter. They can definitely do more than entertain. 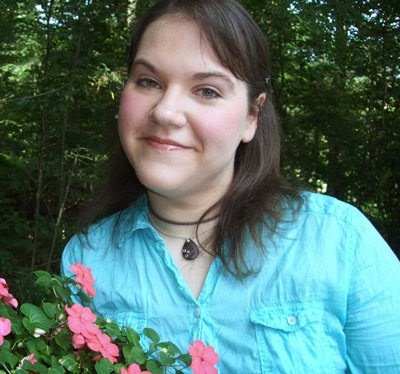 Cerella - congratulations on being a good writer and a great person. What a tough issue to tackle, but what a good platform you have to do that. In the current AARP magazine (good for you that you're too young to have a subscription!) is an article by Louise Penny, a mystery writer, about losing her husband to dementia. Not precisely the same thing, but close enough that it's easy to relate to her plight. It's hard enough to watch a loved one's body deteriorate, but to lose that connection with them when the mind recedes must be an awful thing. Good work, Woman! Aw, thanks, Muriel! Your comments are always so encouraging to me! I tackled early onset Alzheimer's specifically, but any kind of disease like that - common Alzheimer's or dementia is also devastating. I'll have to see if I can pick up a copy of that AARP magazine to read the article. Thanks for mentioning it and for your kind words! Thank you, Patricia! That was one of the biggest points for me while writing the story - trying to imagine what it would be like to just forget my loved ones, to have no recollection of them when I looked at their faces. And to know that's what I'd be losing. It was heartbreaking to write, but I also hope I instilled a note of hope! Thank you so much for the congratulations! What a wonderful post. I'm proud of you for tackling this and for donating. I look forward to the book. Thank you, Beth! I really appreciate such kind words. I hope I did justice to the families who struggle with this diagnosis. Thank you Cerella for tackling a tough topic and for helping to fight this terrible disease! Thank you, Amy! I hope the story can help raise awareness for not only common Alzheimer's but this even more insidious form of the disease. Thank you for bringing attention to this horrific disease, Cerella...it's quite admirable. I'll certainly be one of I'm sure many, who will pre-order your book. I really appreciate your support, Jill! And you have my sympathies on your mother's diagnosis. I pray for strength and courage for you because you're right - it is one of the biggest challenges you'll face in life. Thank you so much for sharing your personal connection to the disease. It's people like you that helped inspire A Song for Rory.